In this post, we are going to show you how you can set up and compile Sass in ASP.NET Core 2.0 MVC. Read on to get started! 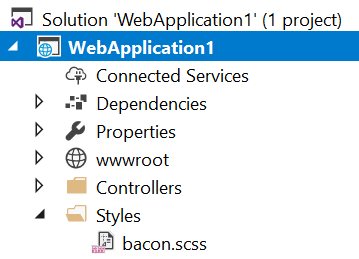 In this post, we are going to look at how to set up and compile Sass in ASP.NET Core 2.0 MVC. This is my third post on ASP.NET Core 2.0, if you are new to ASP.NET Core then it is worth checking them out. Back in 2014 I wrote about how to compile Sass in Visual Studio using Grunt and Task Runner Explorer. This is still my process for compiling Sass in my projects. Now that I am porting my projects over to ASP.NET Core it's time to find out what has changed when using a CSS preprocessor such as Sass. For this post, I am using Grunt but you could also use Gulp, it's purely a matter of choice. All my existing projects use Grunt so I'm going to continue using that. Add Grunt to the project. Add Sass to the project. Compile Sass to Css using Grunt. Node.js is installed. If you do not have it go install it first. You are using Visual Studio on a Windows PC (isn't it great that it's no longer an assumption you are using Windows?!). Start by adding a Sass file to your project. Create a folder in the root of the project, I've kept mine generic and called it Styles, you could call it Sass or what ever you like. Now add a Sass file to the folder. We are going to be using Node Package Manager (npm) to install the components we need. The packages used are stored in package.json. This is added to the root of the project and is done so by running the following command in command prompt. Now add Grunt's command line interface (CLI) to the project. The CLI runs the installed version of Grunt. Note: For this article, we are installing Grunt and the CLI for the local project, but if you are going to be using Grunt for other projects it is worth installing both globally. Use grunt-sass to compile Sass. This package uses LibSass, a C/C++ port of the Ruby Sass engine. If you are on a Windows machine you can use this without the need to install Ruby. grunt-contrib-sass uses the original Ruby-based engine. grunt-sass is installed with this command. With the packages installed, add a .js file to the root of the project called gruntfile.js. Here we will add a task to compile Sass. The startup directory is Styles. We've set src to be recursive so we can add a folder structure and it will still work. The destination for the CSS is wwwroot/css. Everything is now ready to run. 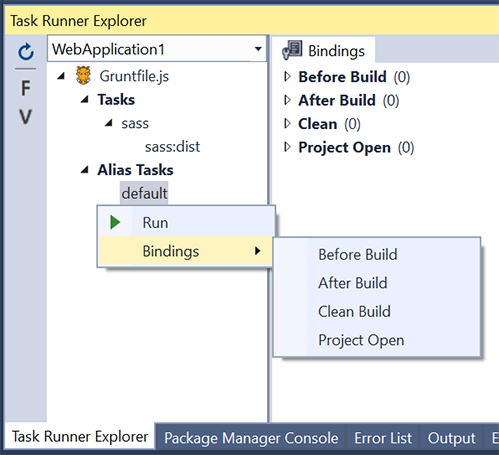 Open Task Runner Explorer in Visual Studio from the tool bar View -> Other Windows -> Task Runner Explorer or right click on gruntfile.js in the Solution Explorer and select Task Runner Explorer. You can run the task (named default) from there. Note: If you get this error when running the task (I did), follow this Stack Overflow answer to fix it. >> This usually happens because your environment has changed since running `npm install`. >> Run `npm rebuild node-sass --force` to build the binding for your current environment. Having to manually run the task each time could become tiring very quickly. Luckily there are some build options available. In Task Runner Explorer right click the task and select Bindings for four compilation options. Selecting After Build, for example, will run the Grunt task after every build. Selecting a binding adds a reference at the top of gruntfile.js like this. In this article, we have used Grunt to compile Sass to CSS and added a binding to automatically compile after every build. As you can see it is very straightforward, completely flexible, and extendible. You can easily add other packages such as linting or prefixing. In terms of the process very little has changed, the only difference is you must now compile CSS to the wwwroot folder. This is good news for those who are migrating projects to ASP.NET Core. Published at DZone with permission of Colin Bacon , DZone MVB. See the original article here.